You ever see a picture of something and you make an involuntary, incoherent noise because the subject is just that awesome? That just happened to me when I saw this picture of an Aston Martin Vanquish Zagato Shooting Brake. Back in August, we found out that we’d be getting an Aston Martin Vanquish Zagato Volante, Vanquish Zagato Speedster and Vanquish Zagato Shooting Brake. Shooting brake! 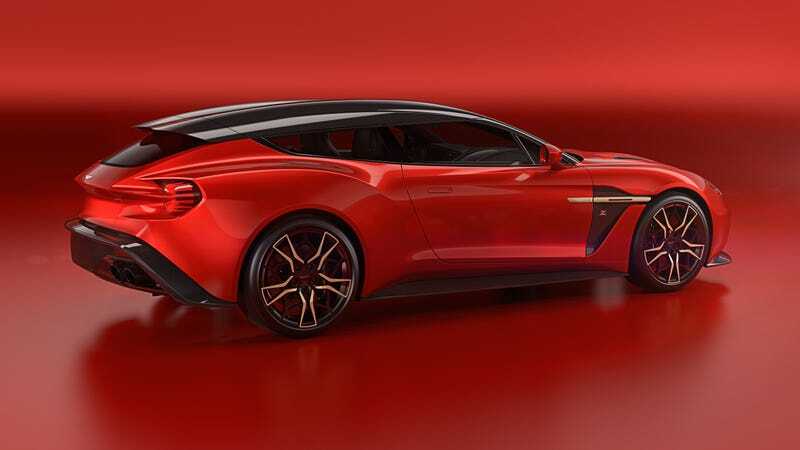 The Zagato Shooting Brake will still have Aston Martin’s naturally aspirated V12 with 580 horserpower and will only have two seats. Whatever—just look at it! Aston Martin will make only 99 Shooting Brakes and I would very much love to see one driving around very soon. I Think I Went, "Urngghuuuuhnuh"